The ripples and dimples of cellulite can appear on anyone. Even a super-toned physique may be prone to patches of cellulite no matter what adjustments are made to diet and exercise. Cellulite results from the way the body holds certain fat deposits, not necessarily from the overall amount of fat present. Underneath the skin, fibrous cords of connective tissue (septae) secure the dermis to the muscle. In some areas, these cords align in a vertical pattern with uneven sections between them, creating small pockets in which adipose tissue (fat) collects. The fat cells push up toward the surface producing that characteristic lumpiness associated with cellulite. Profound RF, by Syneron Candela, presents a simple, painless, non-surgical solution to reduce or remove cellulite by treating it at the source—recalibrating the fibrous cords that support the skin and breaking down the adipose tissue trapped between those cords. FDA-approved for your safety, Profound is the FIRST device with temperature controlled RF (radio-frequency) clinically & scientifically proven to deliver energy directly to the deep dermis for a comprehensive treatment of Dermal & SubQ layers of the skin. Profound uses microneedle electrodes inserted into the subcutaneous layer of fat to distribute radiofrequency (RF) energy which then stimulates the dissolution of adipose tissue and the revitalization of the septae. This thermal activity triggers a natural healing mechanism which also produces new elastin, collagen, and hyaluronic acid, further enabling the treatment area to tighten. The Profound procedure works within the skin, not on top of it, to catalyze an internal transformation. 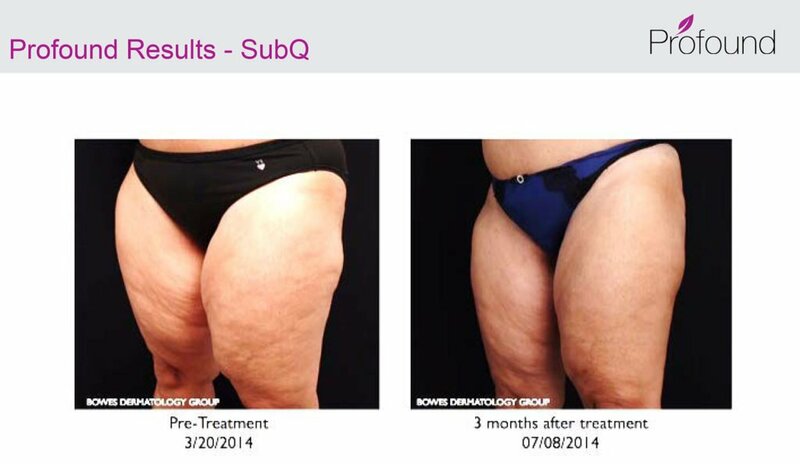 Who is a Good Candidate for Profound Cellulite Treatment? 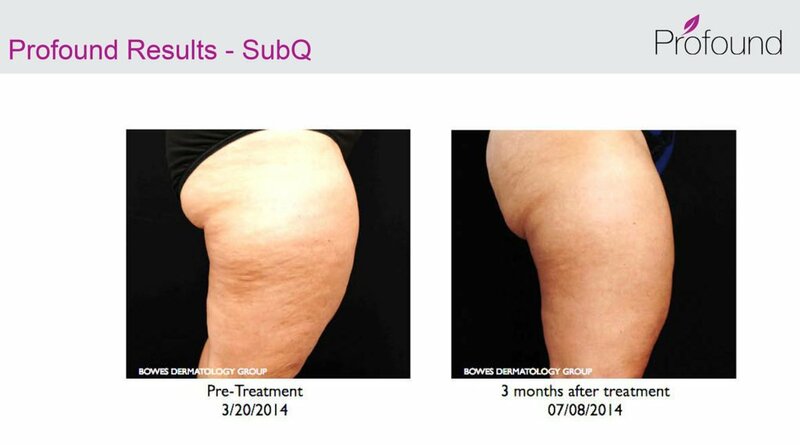 Profound is perfect for patients who desire to improve body cellulite & tighten the skin’s appearance. The in-office procedure begins with the application of a numbing solution to reduce any discomfort from the microneedles. Once the solution activates, the clinician uses the hand-held Profound device to deliver RF energy to the treatment areas, melting fat and smoothing the skin. The procedure takes one or two hours, depending on the area covered, after which the patient may resume normal activity. Some mild bruising, redness, and swelling in the treatment area(s) are expected. There is temporary downtime due to the bruising and swelling, which can last anywhere from 5-10 days. The healing process can be accelerated by using Arnica Montana and continuously icing the treated area. Within a few weeks, initial results begin to emerge with the maximum impact apparent 6-9 months. Only one treatment is typically required for significant change and improvement. Elastin is a protein that coils and recoils like a spring within the elastic fibers of connective tissue in the body – like your skin. Elastin is what makes your skin, heart, lungs, and many other tissues elastic so that they can snap back into shape after stretching or contracting. Elastin works together in your skin with collagen. Elastin provides elasticity and collagen (another protein in your skin) provides structure to keep your skin smooth and firm. What is the effect of a lack of elastin as we age? Starting in our mid 20’s, elastin starts to break down and become less elastic and lose its spring – think of a lumpy mattress as the springs become old and lose their ability to recoil. How do you build new elastin? Elastin is normally no longer made after puberty and aging begins. In order to build new elastin, you need to cause a certain amount of damage to the skin by heating for example, so that the elastin starts to break down. Then a healing process can begin to build new elastin. What is the best method to build elastin & collagen? Profound is clinically-proven to build elastin and stimulate collagen. By carefully heating the skin’s elastin & collagen to an exact controlled temperature for an exact amount of time, Profound leads to the creation of new elastin and collagen to repair aging skin. How many Profound treatments will I need? You will only need 1 treatment to rejuvenate your skin with Profound. There is no need to schedule multiple office visits in order to achieve optimum results.